Working on a couple of big things right now that I'm not ready to discuss quite yet. But in the meantime, I'll do a little catch-up. This is a fun project I worked on back in December. My friend Sam Hale is directing a short film/music video called "Yamasong" based on the music of the group On Ensemble. 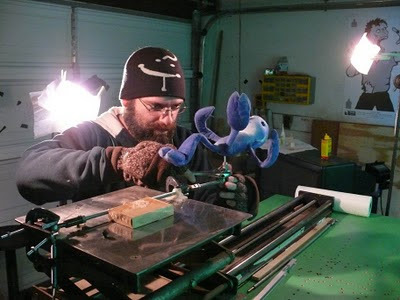 The film uses some beautifully hand-crafted rod puppets. Heather Henson is producing and the film should start showing up at festivals (including her Handmade Puppet Dreams Festival) in the first half of this year. Now, you might be asking, "Pete, how are you involved with a film that seems to be all rod puppets?" Well, here's where Cloudy comes in. Cloudy is a Miyazaki-inspired floating cloud character that accompanies the heroes on their journey. He also happens to be the one stop motion animated character in the film. 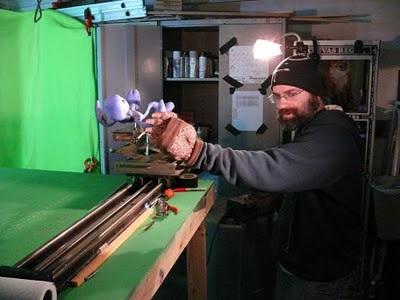 Cloudy was designed by Jesse Gregg, armature by Greg Sesma, and foam buildup & finishing by Sam. I animated Cloudy in my garage and had a lot of fun doing it. The rough cut of Sam's film looks incredible. Can't wait to see it finished and on the big screen! *Unlike where I'm animating right now. Pete, this is awesome! I think my favorite part is the beard. I can almost imagine you in a remote research station in the Antarctic making a stop-motion film! Thanks for the post. Awesome post Pete. It's been great to see all of the different aspects come together for the film. You, Sam, and all of the other parties involved are truly talented at what you do. Oh, and awesome reels on your main page. thanks for the pics man!